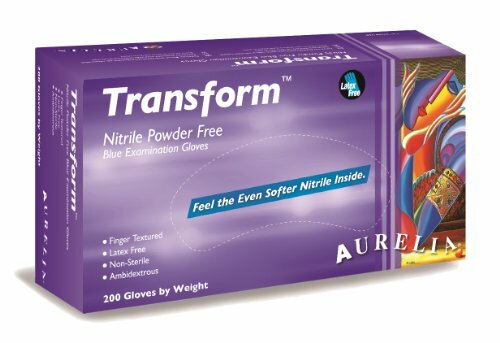 The Aurelia Transform 9889 nitrile, powder-free, disposable glove is textured along the length of the fingers for improved grip compared to a glove with textured fingertips. The glove has a palm thickness of 2.8 mils and a finger thickness of 4 mils, and is 9.5" long from the tip of the middle finger to the edge of the beaded wrist cuff, which is 2 mils thick. Nitrile provides better elasticity than vinyl, better puncture resistance than latex or vinyl, better abrasion resistance than chloroprene, and reduces the likelihood of allergic reaction. This powder-free glove leaves no residue, reducing the risk of contamination compared to a powdered glove. This ambidextrous blue glove is suitable for dental and medical examination applications. Manufacturer: Aurelia Div. Supermax Inc. Publisher: Aurelia Div. Supermax Inc. Studio: Aurelia Div. Supermax Inc. If you have any questions about this product by Aurelia, contact us by completing and submitting the form below. If you are looking for a specif part number, please include it with your message.